Paul Emmerson Conner was born February 2, 1940 in Ashland, Oregon, to George and Ila Conner. He later was joined by his younger brother, David, to complete their family. Paul attended school in Talent Oregon graduating in 1958. After working a couple years, he joined the Air Force in 1960 and was stationed at Loring Air Force Base in Limestone Maine for 4 years. He married Carole Paul on April 24th 1965 in McMinnville Oregon. They lived in the Medford area before making the final move to Dayton in 1972. Paul worked for Mitchell Brothers Truck Line for 31 years as a dispatcher. He joined the Dayton Fire District and served his community faithfully for 46 years and was awarded Fireman of the Year in 2012. 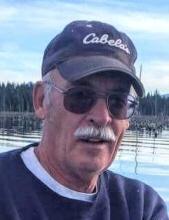 Paul was an avid outdoors man who loved camping, fishing and hunting. His favorite fishing and camping spot was Crane Prairie. He hunted deer and elk with rifle, traditional black powder and archery. He and Carole had many road trip adventures; driving to Alaska multiple times with friends and family, spending a few winters as snowbirds in Arizona and other trips around the western United States. He loved watching Dayton High School sports. He took classes at Chemeketa to learn taxidermy and even has a few projects Carole allowed him to keep in the garage. Paul is survived by his wife, Carole Conner, son & daughter-in-law, Stephen and Elaine Conner, daughter & son-in-law DeEtte and Brett Snyder, daughter & son-in-law Denise and Jason White, four grandchildren, two step grandchildren, one great grandchild and brother & sister-in-law David and Marianne Conner. He was preceded in death by his parents, George and Ila Conner. The celebration of his life will be held from 1-3 PM Saturday, November 10, at the Dayton Fire Hall, 500 7th St. in Dayton. In Lieu of flowers, donations may be sent to Dayton Fire District, PO Box 337, Dayton OR 97114. To send flowers or a remembrance gift to the family of Paul Emmerson Conner, please visit our Tribute Store. In Lieu of flowers, donations may be sent to Dayton Fire District, PO Box 337, Dayton OR 97114. "Email Address" would like to share the life celebration of Paul Emmerson Conner. Click on the "link" to go to share a favorite memory or leave a condolence message for the family.